I wanted to get in one more winter adk 46er climb before the winter season was officially over. March 18 looked excellent, weather-wise, so we headed down to the Adirondacks to do 'something'. We agreed that we wanted to do something in the 15km-ish range, so I suggested Phelps. Pu and Jenn had never been up Phelps, in any case, so this would be nice for them, too! The weather was indeed fabulous as we started off on a clear, crisp but not too cold morning, from the South Meadows trailhead. On the way down, I got to try out the next iteration of my "ground-skiing" device - a crazy carpet with attachment points to allow it be fastened behind. I got many interesting looks from uphill hikers, but I did manage to cover quite a bit of distance with it! Tricky to steer, though, and I will have to come up with a simple but effective directional control. We were down at Marcy Dam in no time - we spent a long time there, lazing about on a log next to Marcy Dam, soaking in the very warm late winter sun. Lots of little critters were out, presumably because spring was near! For this climb of Phelps, we decided to hike in using the South Meadows Trail. The prices for the ADK Loj parking area was steadily rising, and was now a fairly expensive $9 per vehicle! The South Meadows parking area is free, and trail, although a little bit longer, is a fairly straightforward fire road. Plus we'd all been on the ADK Loj-Marcy Dam trail so many times it was nice to have a chance to hike in a different way. Soon after starting the hike, we came across an amazing Beaver dam constructed right alongide the trail - amazing work. Took about an hour to reach Marcy Dam, and then only about another hour and a half to the summit. 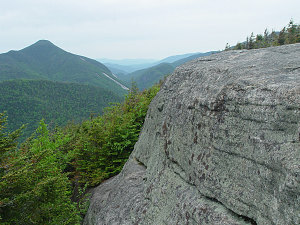 Although cloudy, the views were still far-ranging from the summit ledge. Started to take summit pictures of one of my favourite summit snacks: Dare Cinnamon Danish cookies. Down and back to the car took only two hours and 45 minutes, even with the extra distance of the South Meadows trail. Participants: Luke Ward, Andrew Lavigne, Rob Hounsell, Mark Enright, Andree Plouffe? Rob Hounsell's first hike with us. There was still quite a bit of snow - Marcy Dam was still frozen over. 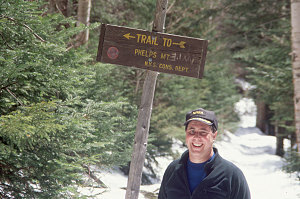 I remember that Mark had an early GPS unit, which could only get a lock in totally open areas like at Marcy Dam. Lots of snow all the way up to the summit. Luke has a propensity for nailing his skull on overhead branches, and this hike was no exception! 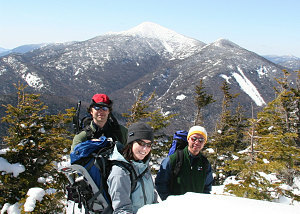 The very summit of Phelps is treed, but just off of the summit is an excellent ledge with good views to the south towards Colden and Marcy. The descent was uneventful and quick. Having a hard-packed snow trail meant a quick slide down back to the Van Hoevenberg trail, and from there a straightforward walk back to the Adirondak Loj parking area.